Yesterday morning I picked up a copy of The Hobbit Party: The Vision of Freedom That Tolkien Got, and the West Forgot by Jonathan Witt and Jay W. Richards. Ignatius Press published the book a few weeks ago and I've wanted to read it since I learned of its publication. From the advertisements I heard for the book, I took it to be something like a political vision extracted from the legendarium of J.R.R. Tolkien that would provide the framework for a new political party based on the running of things in the Shire (which appeals to me greatly), one that might be able to contend with the ideologies and political parties of our present day (none of which greatly appeal to me). In this hope I was disappointed, but perhaps my expectations were too high (this is often a problem for me). The Professor, after all, did not set out to write a political philosophy at all but rather to put forth, as he wrote, a critique of "Death and the desire for deathlessness" (Tolkien to C. Ouboter, Voorhoeve en Dietrich, April 10, 1958). Because of its largely thematic approach to exploring The Hobbit and The Lord of the Rings (as well as others of Tolkien's works), and possibly because of having two authors, this is a book that does not feel quite yet finished, almost as if it were a collection of essays simply put into a book without a thorough effort to blend them into a unified whole. The themes explored by the authors are varied and far-reaching: government, farming, the common good, power, Big Brother, freedom, evil, just war, greed, capitalism, socialism, distributism, localism, and, of course, death (to name but a few). All this being said, however, the book is not without merit. Rather than putting forth a political vision based on Tolkien's thought, Witt and Richards set out to use Tolkien's thought to bolster a political vision that includes small government, individual freedom, a good use of the land, and the principle of subsidiarity, a task at which they are successful. In this endeavor, and given the current political situation in the United States of America that has been unfolding now for more than a decade, particularly in the form of ever-increasing regulation of seemingly every aspect of life, the book is both timely and needed. Perhaps most remarkable of all, their arguments never descend into partisan attacks but remain at an elevated level so as to set forth a world view with which to make principled - not partisan - political decisions. The lesson is old and oft forgotten: even well-intentioned leaders are tempted to annex to themselves more and more power in their efforts to fight evil and improve the lot of their people. In such cases, the potential for good lies in plain sight, while the danger of unchecked power seems distant, abstract, and quite manageable. What distinguishes the wise leaders of The Lord of the Rings is their ability to see past this illusion (73). "A free and therefore lawful society, at a minimum, will never force a person to choose among alternatives all of which commit him to some intrinsic evil, such as violating the rights and dignity of himself or another" (102). "People in a free society will have broad freedoms in the market" (102). "...a richly free society allows its people to pursue freedom for excellence; it encourages rather than discourages them to pursue their own calling and passion" (102-103). "We know empirically that a free economy, of all the options, best coordinates the gifts and needs of a diverse population" (103). The authors are right to note what others frequently miss, that Tolkien's "thought taken as a whole is quite pluralistic" (155), but that Tolkien still "beat the drum of small government when the rest of the world was running headlong into arms [sic - there are other similar errors throughout the book] of Big Brother" (154). Were I editing The Hobbit Party, I would have taken the authors' Epilogue and made it the Forward. Doing so would have given a fuller sense of purpose and direction to the text of the book. ...by rejecting not just an ideology but a subtle process, long at work among Western democracies, that leads by slow degrees from a free Shire to a place where creative energy and opportunity give way before the twin opiates of false equality and an all-embracing administrative bureaucracy (187). This is a good summary of the overall argument of The Hobbit Party, but to put it even more succinctly, the authors are right to assert that "what [Tolkien] consistently opposed was democracy put in the service of socialism and the tyranny of the majority, and he tended to fear the worst in such matters" (189). There is every reason to have the same fear regarding the current situation in the U.S. - and elsewhere - today. At the same time, though, if I were editing The Hobbit Party, I would take the Foreword by James V. Schall, S.J. and make it the Epilogue. In his Foreword, Father Schall rightly suggests that "the reading of Tolkien at any adult age makes you young again. But it also makes you wonder if you are wise, with the kind of wisdom we find in Bilbo, Frodo, Sam, Gandalf, and the forces of good that populate Gondor and the Shire" (9). Such a statement, turned into a question, would be a good end to The Hobbit Party and an excellent way to motivate the reader to ask himself if he also has the political wisdom of Tolkien. Yet, as I said earlier, this is a book that does feel quite yet finished. Although Witt and Richards do not create a new political party - the Hobbit Party - the political thought they highlight in their book could well lead to the creation of such a party, a political party based on the freedom inherent in the dignity of the human person. Let us hope the book will soon be completed. THE COLDEST TEMPERATURE EVER OBSERVED SO LATE IN THE SEASON. OLD RECORD OF 14 DEGREES WAS SET IN 1888. I don't know why the NWS still writes in capitals and with line breaks, but I don't feel like taking the town now for fix either. Frankly, I'm very glad I missed these two new records; I'm not quite sure how I would have withstood such cold temperature, especially given what I am growing accustomed to here in the Eternal City. Back in Illinois, the temperature would not have been warm enough to wear shorts and a t-shirt while reading the book, but the sun seems to shine more warmly over Rome. I began the book yesterday and finished it a few minutes ago, in the spot under the same warm sun with a temperature of only 59ºF. And it's not quite Spring yet, either. After this, Illinois may be the death of me. The minus 12 degrees recorded at 6 a.m. Friday shattered the previous record low for Feb. 27, readings of 3 degrees below zero in 1888 and 1934. That, combined with expected temperatures ranging from 4 degrees to around 26 degrees Saturday "may be enough to bring it (the monthly average temperature) down some — enough to crack the top 10," said John Parr, meteorological technician with the National Weather Service in Lincoln. "It's possible." Through Thursday, the average monthly temperature for Springfield this month was 21.6 degrees. The 10th coldest February here since records started being kept in 1879 was a 21.2-degree average in 1914. It is unlikely that this February will end up being colder than last February, when temperatures averaged 20.1 degrees and put February 2014 at No. 7 on the coldest Februaries list. The coldest February on record here is 1978, when temperatures averaged 16.6 degrees. Second coldest was February 1979, with a 17-degree average. Although Catholics are not required to eat fish on every Friday, it has long been customary to do so. Indeed, the custom of eating fish on Fridays and not meat earned Catholics in some parts of the world the disparaging title of "fisheaters." Every Catholic Christian understands that the fast and abstinence regulations admit of change, unlike the commandments and precepts of that unchanging divine moral law which the Church must today and always defend as immutable. This said, we emphasize that our people are henceforth free from the obligation traditionally binding under pain of sin in what pertains to Friday abstinence, except as noted above for Lent. We stress this so that "no"scrupulosity will enter into examinations of conscience,confessions, or personal decisions on this point (Pastoral Statement on Penance and Abstinence, 23-25, emphasis mine). doing volunteer work in hospitals, visiting the sick, serving the needs of the aged and the lonely, instructing the young in the Faith, participating as Christians in community affairs, and meeting our obligations to our families, our friends,our neighbors, and our community, including our parishes, with a special zeal born of the desire to add the merit of penance to the other virtues exercised in good works born of living faith (27, emphasis mine). Each of these are worthy, pious, and holy things to do, but, regrettably, this hope has not born great fruit over these past forty-seven years as Catholics generally treat Friday as any other day of the week, if not as a particular day of celebration, in keeping with the secular culture, with little recognition of Christ's love poured out for us on the Cross. Even so, Catholics in the U.S.A. are still bound by the requirement of canon 1251 to abstain from the eating of meat - in Latin, carnis - at least on the Fridays of Lent. The most fundamental reason, however, is that in Latin and in the major European languages (French, Spanish, etc. ), the word for “meat” never includes fish. Since the custom, for the Latin Rite of the Church, arose in Latin and Romance-language areas, it reflects this fact. Since that time, the term “meat” has become restricted to what you find attached to the bones of mammals (flesh) and the bones of birds (fowl), and sometimes to what you find attached to the bones of fish, but that use is not universal even today. For this custom, minimal as it is, Catholics in some parts of the country are still criticized or at least questioned, though they are rarely any longer derogatorily referred to as fisheaters. Sadly, most Catholics do not know how to respond to questions about why we do not eat meat on Fridays during Lent. The most common objection given against this Catholic practice is that the custom began solely in order to benefit the fishmongers of Rome some centuries ago. This claim, of course, is sheer rubbish, both because Catholics are not required to eat fish (and so such a decree, if there was one, would not really benefit the fishmongers) and because no one who makes such a claim can point to a historical connection or decree. What is more, too, Catholics have been abstaining from meat on Fridays long before anyone attempts to make the fishmonger assertion. But surely there is more than a linguistic reason as to why we are allowed to eat fish on Fridays? Of course, there is, though - in my estimation - it likely came later. For when God, for Adam’s sin, cursed the earth and the land, he cursed not the water; wherefore it is lawful for a man to eat in Lent that which cometh of the water. We are certainly able to eat fish, because the Lord accepted one after the resurrection. Neither the savior nor the apostles have forbidden this (1.45.2). The penances we take up on Fridays are, after all, intended to help us recall the sufferings the Lord willingly endured for us. His suffering, of course, did not end with his Death, but culminated in the Resurrection. The time of our resurrection, though, has not yet come, and so we now willingly take up some form of penance to join our sufferings to his. If we, then, eat fish and not meat on Fridays as we remember the Lord's death, it can be an opportunity for us not only to give up the pleasure of a steak or a pulled pork sandwich (one of my favorites) but also an opportunity to remember the Lord's mercy and the promise of the resurrection of the body and the life of the world to come. Amen. Not only is it delicious, but it couldn't be easier. In fact, it's maybe too good for Lent! 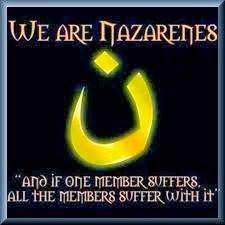 For reasons that I cannot fathom, NBC did not cover the kidnapping of some 150 Assyrian Christians by the Islamic State. NBC was not alone in this, as Telemundo and Univison also did not cover it, and ABC and CBS gave it only a passing mention. It has been suggested for some time now - by those both within and without the media - that the media should not cover the activities and atrocities of the Islamic State because doing so gives them more exposure and turns the jihadists into celebrities. As you might imagine, I have never agreed with this line of thinking because it is akin to saying, "See no evil, hear no evil, speak no evil." It seems to indicate a certain line of thinking that if we ignore the Islamic State it will lose influence and fade away. This is simply foolish and very dangerous. The argument makes as much sense as arguing that the media should not have covered the growing influence and strength of Adolf Hitler and the Nazis or the horrors of the Holocaust. No one - so far as I have seen - would make this argument about the Nazis, so why use it in reference to the Islamic State? Because people did not speak out and act forcefully when they knew full well horrendous evils were being committed by the Nazis, 11,000,000,000 were killed. It happened not that long ago, and it can happen again today. I dare say it will, unless we change our response to the Islamic State. Ignoring Hitler did not stop him. Ignoring the Islamic State will not stop it. so we ask you, at their intercession, to save Syria from every evil. which you made the starting point of your light and love to the whole world. and be a beacon to the entire world. Mary, Mother of God, pray for Syria. St Paul, pray for all Christians in the Middle East. Who are the Assyrian Christians under attack from the Islamic State? UPDATE (02-28-15): 12 Things to Know About "What ISIS Really Wants"
UPDATE (02-25-15): Can We Win the War Against ISIS By Focusing on Social Media? UPDATE (02-23-15): Why are girls flocking to ISIS? UPDATE (02-20-15): Who holds the real power in IS? UPDATE (02-19-15): Islamic State harvesting human organs for revenue? UPDATE (02-19-15): 21 Christians were just beheaded. And I'm stressing about giving up sugar for Lent. UPDATE (02-17-15): ISIS Is Itching for a New Crusade - What Should We Do? Why Are We At War With The Islamic State? UPDATE (02-13-15): Kayla Mueller's faith: What was God's role in life of American killed while being held by Islamic State? Kurds & Volunteers Take Kabane From ISIS; Media Silent? Life is harsh under the Islamic State, but what's the alternative? UPDATE (02-09-15): ISIS has reached new depths of depravity. But is there a brutal logic behind it?